Last Saturday I headed over to Sheffield with my friend to take a look at the Vintage Fair. 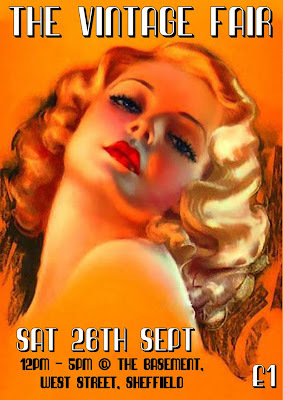 It's wonderful get together of vintage stalls, clothes, jewellery and lots more! There was so much to see and I particularly enjoyed the Fancie Cupcakes on offer! I managed to get one rather naff picture as it was so busy it was hard to take any pictures! But I did pick up this lovely vintage hand bag for just £5... Bargain! The Vintage fair is coming to Manchester next Saturday the 10th of October and I will be showcasing my work and newest designs, some of which wont be available on the websites. It starts at 12pm until 5pm and is at The Met on Oxford road please Click here for more details! Congrats on the bargains. We have fairs like that here in Australia. You can get some great pieces for next to no price.